Liam O'Connor should have died at sea in 1912. Maddy Carter should have died on a plane in 2010. Sal Vikram should have died in a fire in 2026. But all three have been given a second chance - to work for an agency that no one knows exists. Its purpose: to prevent time travel destroying history...Relocated to Victorian London, the TimeRiders joy-ride back to 1666 to witness the Great Fire of London. In the ensuing chaos, Liam and their newest recruit, Rashim, find themselves trapped between the fire and the Thames. They escape onboard a river boat, only to be confronted by an unscrupulous captain with his heart set on treasures of the high seas...Back in 1888, Maddy and the rest of the team are frantically trying to track them down. But with limited resources at their new base, can Liam and Rashim survive the bloodthirsty and barbaric age of piracy long enough to be rescued? 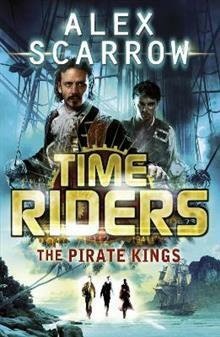 This book seven is in the bestselling TimeRiders series by Alex Scarrow. The Golden Age of Piracy get a time-travel makeover! It is perfect for fans of Doctor Who and Pirates of the Caribbean . TimeRiders (Book 1) won the Red House Book Award older readers category, and was Penguin UK's first ever number one on the iBookstore.